Among his many notable images was the notorious "butcher" sleeve - which was later withdrawn - for US album Yesterday And Today, as well as his shots for the cover of Revolver. Whitaker died on Tuesday after a lengthy battle with cancer, confirmed his friend, photo archivist Dave Brolan who has curated a number of his exhibitions. 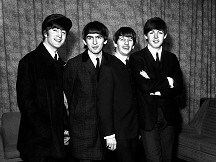 The British photographer, who was born in 1939, began his two-year association with the Beatles in 1964 when they visited Australia where he had been working, taking their pictures for Melbourne's Jewish News. The band's manager was so impressed he offered Whitaker the job of staff photographer for his company NEMS. He went on to take pictures of Epstein's other acts who included Cilla Black and Gerry & The Pacemakers. Whitaker shot the Beatles at Shea Stadium, numerous posed shots of the band's tomfoolery over the years, as well as the images which artist Klaus Voorman assembled for his Revolver collage. His famous cover shoot for Yesterday And Today saw the Fab Four dressed in white coats with dismembered dolls and cuts of raw meat. It was used for the cover shot and some music paper ads, but the sleeve was quickly replaced - with an image of the band gathered around an upturned trunk - because it was felt to be unpalatable. In an interview, Whitaker recalled: "It was hard work. I had to go to the local butcher and get pork. I had to go to a doll factory and find the dolls. I had to go to an eye factory and find the eyes. False teeth. There's a lot in that photograph."